Be sure to check out the “About” page from the “CSA Vegetable Box” menu for a general overview of our CSA (including our 2019 crop plan). Thanks for reading this page with care. 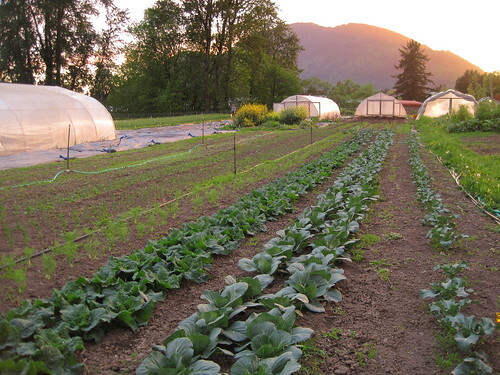 You should find all the details you need about our 2019 Chilliwack CSA Vegetable Boxes here. Reserve your spot in our 2019 CSA by filling out the sign-up form. Payment for the entire CSA Box season is due when you come to pick-up your first box. We collect payment on the first Summer box pick-up and the first Autumn box pick-up. You have the option to sign up for both seasons or just one (subject to spots available). Please contact us if you can’t pay for the whole season at once and need to discuss other payment options. On the first box day, please tell us about any pick-up days that you will be away; you will not have to pay for those boxes in your lump-sum. If other vacation/work plans come up after you’ve made your payment and you can’t get a friend or family member to pick up your box for you, please contact us up to 24 hours before the scheduled pick-up. We can cancel your box for the day you’ll be away and give you a credit towards a future box (i.e. in the Autumn season). Pick-up is on TUESDAYS between 4:30pm – 6pm, at the farm (42408 Adams Rd. in Chilliwack (Greendale). Please bring a bag or box with you to bring your vegetables home in. September 17th — sometime in December, depending on the weather. We send out a reminder email the morning of a box pick-up day to help you remember but will not issue a refund if you miss picking up your box during the allotted times. Thank you for understanding that, due to time constraints, we are unable to accommodate making alternate pick-up arrangements for unclaimed boxes. Your box will be given to someone, consumed by our family or other farm helpers, or in the height of the season, our hens may feast on select vegetables from your box (like greens & cucumbers, which they really like). Step #1: Fill out our sign-up form. If you are planning on sharing a box with a friend, you’ll need their contact information handy as well. Step #2: Please complete your registration with us by sending your non-refundable $30 deposit by either e-transfer or cheque. The deposit will be subtracted from the payment due at your first CSA box pick-up. Email money transfers can be sent to abundantacre(at)gmail.com. Please send the answer to your security question to us in a separate email. Thanks! Step #3: Wait (& tell your friends). Once we get your deposit, we will confirm your spot in our 2019 CSA via email and you can look forward to some great eating down the road. It may take a few days for me to get your confirmation email sent out — thanks for your patience. We look forward to growing vegetables for you this season!